Biscuits…. revisited! I have made a COUPLE THOUSAND of these little jewels since I first posted this recipe over 1 year ago! These beauties were the #1 sellers at the Farmer’s Market and I would make 12-15 dozen twice a month and usually sold out! Yeah, they are that good! People who didn’t even care about “Grain-Free” or “Low-Carb” LOVED these biscuits! I say this recipe is a WINNER for everyone!! What can I say, like most southern girls, I love biscuits and I consider myself a biscuit expert! I grew up in rural Georgia, Aline to be exact. We lived across the street from a sweet lady we called “Ms. PeeWee” and she made biscuits EVERYDAY! She made a large fried biscuit out of buttermilk and bacon drippings that she prepared in a cast iron skillet. We called it a Hoe Cake. It was so good. This is not Ms. PeeWee’s Hoe Cake but it is just as good! These biscuits actually remind me of those at Red Lobster, and I have been told by many they feel the same. All the flavor without any grains and low carbs! I can eat these without going into a diabetic coma afterwards! (And I can have more than ONE!!) Red Lobster Garlic Cheese Biscuits have 16 grams of carbs vs. the small version of my biscuits have 1 Net Carb! MAKE extras!!! These are great at any meal and freeze well!! Pop them in your toaster to reheat! Also, the key is using a good quality, sharp cheddar cheese. Don’t buy the pre-shredded stuff. Read the list of ingredients, there is more than cheese in the bag!! ;-( Also, if using heavy whipping cream, be sure it doesn’t contain carrageenan. And for sour cream, the only ingredient should be cream. If you can get cultured sour cream, even better! This biscuit is not for those avoiding dairy. The more dairy I added, the better the biscuits tasted! lol Be sure to finish them with a pat of butter and a sprinkle of parsley. Delicious and B-E-A-UTIFUL!! I started using parchment paper when baking these biscuits because it was an easier clean up but you won’t have the golden brown bottoms. It is up to you. Either way, they will taste wonderful. If you don’t use parchment paper, you will just need to use a sturdy spatula to remove the biscuits. SIZE doesn’t matter when making these biscuits. I usually do make the medium size biscuits using this MEDIUM scoop. Or you can use a small scoop to make more biscuits. The small biscuits would be great for a party, sliced and stuffed with meat and cheese! I have used these as hamburger buns or for an egg and cheese biscuit! Just give these babies a try! NOTE: If you have made this recipe before, be sure to look at my notes. I have changed the baking times and gave more specific instructions. Baking Tip: Using a dark pan verses an aluminum or reflective pan will give your biscuits more rise. Variations: Add crumbled bacon and chives to the batter. NUT-Free Option: Use sunflower seed flour in the place of almond flour. It works Beautifully! Preheat oven to 350 degrees F. In a medium bowl, mix dry ingredients. Then add remaining ingredients and mix with a wooden spoon or spatula until well blended. Use medium scoop (3 tbsp.) to scoop out dough onto un-greased cookie sheet lined with parchment paper (or not, see notes above). Space 2-3 inches a part. 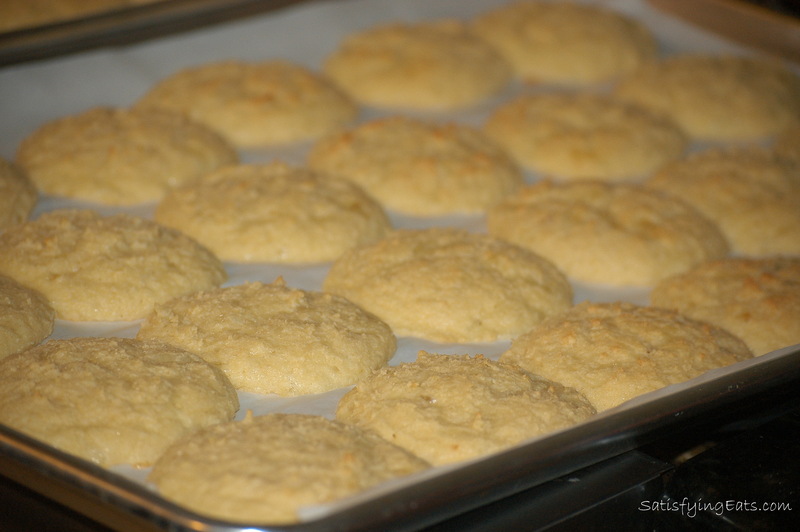 Bake for 16-20 minutes or until biscuits have slightly browned on the bottoms and tops. Once out of oven, smear a bit of salted butter and sprinkle with a little parsley. Best served warm. Disclaimer: Some of the links contained in this post are Affiliate Links. If you make a purchase through the links provided, I will receive a small (very small) commission which I used to buy more ingredients to create more recipes. This is at NO cost to you! I have chosen these products not to receive a commission, but because I think they are the best on the market. These are ingredients and equipment that I actually use. This commission helps compensate me for my time, and justifies the hours a day that I spend in the kitchen creating recipes, on the computer posting blogs, and sharing helpful information with you. By clicking on any links in my blog, you are helping me continue doing what I LOVE to do! These look great! cant wait to try them out!! Donnette, these are delicious!! In one day, I have eaten them with my Roux-less gumbo, eaten them with breakfast and eaten them as the bun for my slider!! I am a happy woman! Hope you like them! Do you have any tips for those who cannot use almond flour? I want to go grain-free, but my husband is allergic to almonds. I wouldn't be able to use almond flour!! I want to try these. You can use sunflower seeds instead of almond flour…Just grind it up in a food processor, works the same in nearly any recipe! Mpmom, could you use another nut flour??? I am not a fan of all coconut flour in a biscuit but I am sure you could use pecan flour or make them when he isn't home because they are that good! 😉 Maybe try 1 tbsp extra coconut flour in the place of the almond??? Let me know if you try it with another flour and how it works! Sorry I couldn't be more help! Perhaps ground flax seed…hopefully, the cheeses would help with the texture problem associated w/ flax “flour” – a little bit “saw dusty”…. I’m happy to hear that Mark! I believe food should taste good… Period! I hope you enjoy my recipes! I made these tonight and I am not sure they will make it to the morning! I flattened them out too much but they still tasted great. Thanks for all of these great recipes! Hi Melissa,I just had a Zuchini Mini-Muffin w/ Cheesecake Frosting (ok, yes, I had dessert first…), & now I'm having these Fabulous! biscuits for the first time, and with a fennel salad I just put together. 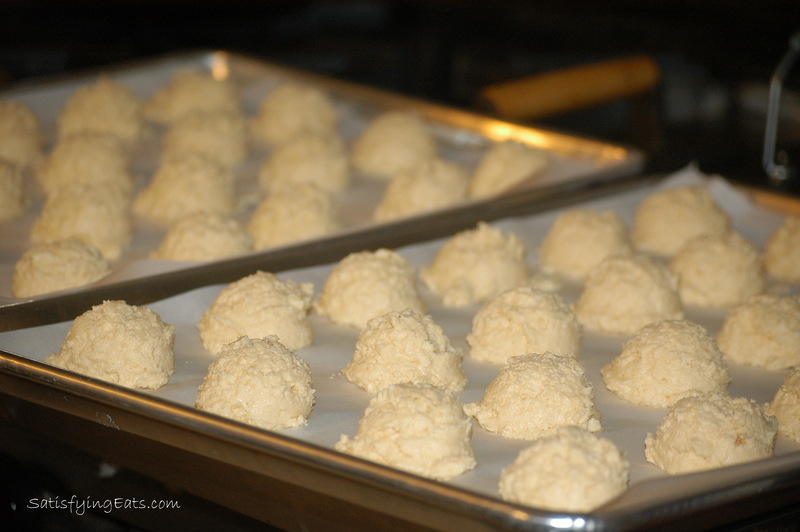 Question: I use a Silpat on a cookie sheet & did so this time with this recipe–do you use one? Also, is there some reason that using a plain un-greased cookie sheet might be better? If so, I'll do it that way next time.Thanks for this recipe! I can hardly wait for your cookbook! I just decided to make them thinner and use 2 for a bun! Great idea! Mine flatten out but I’ll try the muffin pan. I just made these and added some chopped onion–fab! Next time I'm going to add some chopped ham, too–a meal in a biscuit! Just add salad! Where do you get your coconut flour? I shop at Publix and they looked at me like I was crazy when I asked about it. I tried these biscuits tonight for the first time, and….WOW!!! I am a happy girl!!! My kids loved them too! I am soooo excited that I found your blog!!! I have been gluten free for almost a year and low carb for two and a half years, and have been disappointed in the results of most things that use coconut flour alone or almond flour alone. I have thought all along that if I could figure out how to mix the flours that I would have better results, but I am not one to really experiment in the kitchen much. When I found your blog I was so excited!! I have tried your banana nut bread and now these biscuits. I could eat either one of those for breakfast, lunch and supper several days in a row and not be tired of them!! I wanted to wait until I had tried some of your recipes before I bought your cookbook, and now that I have tried a couple I will be buying that cookbook very soon!! Thank you so much for your hard work on this blog! Glad you enjoyed them Rachel! I think the combo of flours helps create a better text to mimic “real” bread! Go glad you ar enjoying the recipes! The cookbook has many more great recipes too! I just made a batch of these for the first time. Mine were a bit bigger than yours: 4 “normal” sized, and 1 small sized. They took about 20 minutes to bake thoroughly, but came out really well. Next time I’ll make the 9 small ones so that they go farther / last longer. Can’t wait to try variations on these. The comment about making them in mini-muffin tins is such a great idea. Beth, glad you enjoyed them! Yes, the size of the biscuit helps with portion control, lol! These are always crowd pleasers! Have you tried my Cheese Biscuits? I have updated the recipe a bit, and I am calling them the “Better than Red Lobster Biscuits!” Oh, and they are still Grain-Free & Low-Carb!! I promise you are going to want to Share this recipe!! I’m trying to figure out how this recipe is different from the one in the book. Looks pretty much the same except everything is halved but the gatlic and salt. Am I missing something? I love all your recipes and cant wait for the next cookbook! I’m planning to make your german chocolate cake this weekend for my birthday. Carmen, this is the recipe in the cookbook. I did add a little extra salt and garlic powder (on accident but it tasted great)! I just clarified some instructions! Glad you are enjoying the cookbook! Let me know what you think of the German Chocolate Cake! Happy Birthday! Having only made them once before, 2 months ago, I’m ready to try the revamped recipe. Wouldn’t you know, I happen to have all of the ingredients. These will go well with leftovers for tonight’s dinner. Hope you enjoyed them Beth! Hi Melissa, this is Gary from Wheat-Free Market Foods. I just made these at home and they are DELICIOUS! I have one note… do you ever use psyllium husk powder? I am thinking I will try these again by reducing the coconut flour by one tablesppon and replacing with 1-2 teaspoons of psyllium husk powder. I like the coconut flour texture but I get a mild taste of coconut. When I was a wheateater I used to LOVE Red Lobster’s biscuits. Anyway, you really nailed it here!!! Thanks Gary for the wonderful compliment! I loved Red Lobster biscuits too, and now I can eat them anytime I want! 😉 I haven’t used psyllium husk in any of my recipes. I found that some people can’t use it so it is just easier to not include it in recipes, and it’s one less ingredient to worry about! Try adding about 2 tbsp or so more of grated Parmesan cheese and even add more grated cheese to the batter. That should offset any mild coconut flavor! Thanks for taking the time to let me know you liked them, it means a lot! I will try that. You are among not even a handful of people who really “get it” and are absolute leaders in this new way of eating, changing lives, and bettering the world. We are trying to do our part too. Hopefully at the end of the day we have made a difference. Cheers! Do these freeze well, before and after baking? I am thinking of making a big batch and freezing before baking, but don’t know how well the sour cream would hold up in the freezer. Might be better to freeze after baking? These freeze very well after baking! I have never thought to try freezing before baking, but my guess would be that it would work because everything would be mixed together. I would not think there would be a problem with the sour cream that way. If you try it, please post your results. I’d be interested to see how it works! Hey Rachel, glad you enjoyed them! I haven’t frozen them prior to baking so let me know how they turn out! I have refrigerated dough before and then baked it and they didn’nt rise so I am guessing a similar outcome but maybe try just one to see. After baking the do freeze well. I tried your cheddar red lobster biscuits last night with dinner and they came out perfect! The one aspect I was most impressed with was how closely the texture matched to the red lobster biscuits I always loved so much….great recipe! Glad you enjoyed them Diana! Curious… I have almond flour (bobs red mill) but not ‘blanched’ almond flour… Can I still use it? Thanks. Looking forward to making them. It should work. Bob’s is a little more courser grind but for this biscit it would work. For a cake, the blanched almond flour from Honeyville would be better! I hope you enjoy them! I made these yesterday, and they were so good I almost literally cried! I have been less than satisfied with most biscuits and baked goods I have tried that do not use traditional flour. Today, I wanted to make some more, but was out of sour cream and cream. I had a whole lot of Greek yogurt, so I decided to try substituting it. It worked fabulously! I could not tell a difference in the two! My kids and husband loved these as well, so I need to freeze the leftovers right after they cool, or there won’t be any leftovers. I thought about using these for a pot pie topping, minus the garlic. I look forward to trying more of your recipes. I made these tonight. Delicious! Thanks so much for sharing! I made these last night and they were absolutely delicious! Really, better than RedLobster! Unfortunately, I have decided that I cannot eat Almond Flour as every time I make something delicious, like this, it sits in my stomach like lead, and I get “digestion issues” …..now, what to do when Ii have that occasional desire for a “bread-like” product? Diane, sorry I have taken so long to respond… 2 kids and 100s of comments later… here I am! 😉 I am glad you enjoyed the recipe. I have not tried it with this specific recipe but I would try equal parts of ground pumpkin or sunflower seeds instead of the almond flour. I did this with my Triple Chocolate Cookie Cake and the recipe turned out delicious! I would use the sunflower seeds here so you won’t have green biscuits. I hope this helps and let me know if you have any other questions. Be sure to “Like” me on Facebook and I usually answer questions quicker there too! Are we supposed to “flatten these before baking? I used the medium scoop and the muffin top pan – half way through baking time I checked and they were still tall, round blobs, figured with all the fat in them that they would flatten out on their own. So I flattened them some then which only resulted in making them too thin to split for egg sandwiches I was planning on using them for. They were very tasty anyway. Love that you also have the calorie count as well as carb count. Love, love, love these biscuits! 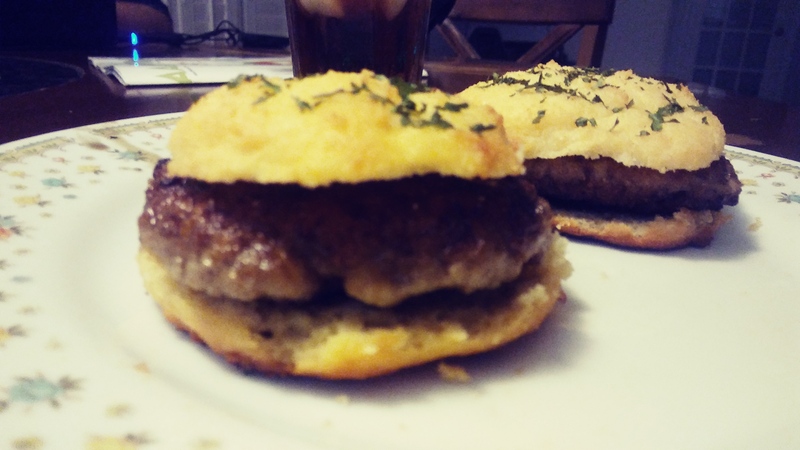 I made a batch last night and used them as hamburger buns. Delicious! I’d like to try these, but I have one in my house with an allergy to COCONUT, in addition to our gluten issues. Diane has been waiting since October 1st. Sorry I ever bought the cookbook since she has changed a good share of the recipes in it and doesn’t answer any questions about them. Candace, I am sorry you feel this way. 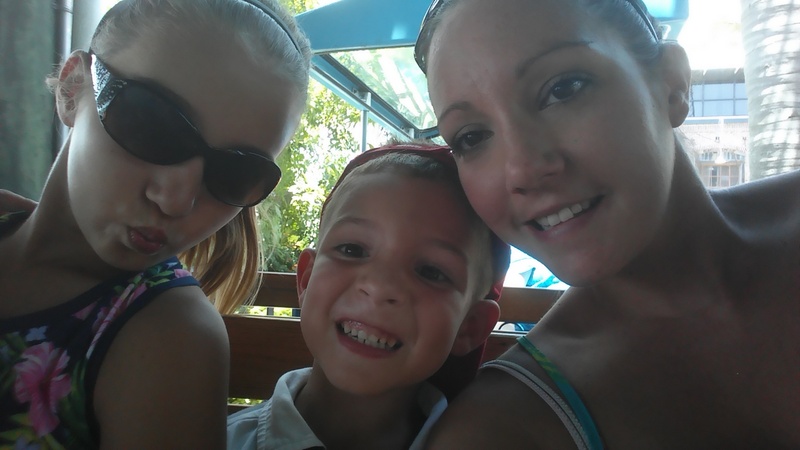 I am a FULL time mother of 2 small boys, which as you can imagine, keeps me busy, busy, busy! I try my best to keep up with comments but sometimes I miss them… I have over 150 posts. Sometimes it is easier to ask questions on my Facebook since I am not having to look at 150 post and hundreds of comments. My First cookbook contains over 250 recipes, of which only maybe 10 of the recipes have been shared after the cookbook was published. Thanks for stopping by and I hope you are enjoying my recipes. Tiffany, I would use an extra 1/4 cup of almond flour instead of the coconut flour. Keep me posted how they turn out and I hope you enjoy them! I have made these twice now. The first time I followed the recipe and loved them. The second time I cut back on the garlic and added 1/2 a cup of cooked, crumbled pork sausage. They were yummy! I might try again with even more sausage to see if they will be more like a bisquick sausage ball. I think they would be great to grab for breakfast at work. Thanks for your recipes. I have enjoyed trying them out. Great recipe. My palate might be overly sensitive to coconut (a flavor I don’t love) since I could taste even this small amount, but if I hadn’t made them I wonder if I would have noticed. Next time I’ll cut back a smidge on the garlic/salt as it was a bit overwhelming, and definitely add bacon and chives. Thanks for this! Glad you enjoyed them Lisa. Yeah, most people don’t taste the coconut but everyone’s pallet is a little different. can’t wait to try these . . . 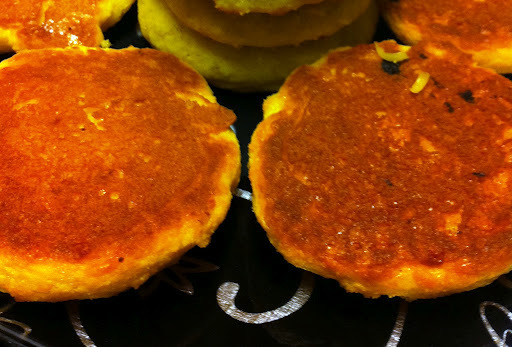 I was interested to read your comment about “hoecake” and that was made as a biscuit instead of cornbread! My mom always made hoecake that way as well and I got in a huge discussion with someone last weekend who said it was always cornbread! Must be a regional thing (I’m in FL just over Ga line!). Mary, I HEART hoecake and yes, people call hoecake different things but to me a hoecake is a big fried buttermilk biscuit. I haven’t had it in a while but even typing the words reminds me of being a little girl! 😉 I hope you enjoy the recipe for these garlic biscuits! It will be a few more carbs but I’m going to replace the almond flour with oat flour. I’m allergic to almonds. Hopefully, they will come out nicely. Good item to bake for T-Day! Would these need to be refrigerated? Or can I put them in my husband’s lunch? Lynette, they can be unrefrigerated for the day as long as it is not hot and humid. Anything longer than 1 day requires cold storage. I made these tonight. I doubled the garlic, because I love garlic. This is by far, hands down, the best GF LC baked good I’ve ever tasted and I’ve been at it since 2001. Thank you! I’m going to try these as a dumpling in turkey dumpling soup for our family Christmas dinner– hope it works!!! Sounds so good! Have you ever substituted sharp cheddar for the mozzarella on the Southern Biscuits? I loved the texture of the Southern biscuits, but thought we could make them with the sharp cheddar tonight. Question. I made these once and they turned out great. This time, they aren’t wanting to set. Was the 2 TBSP of salted butter supposed to go IN the biscuits, or just on top? I don’t remember what I did last time, but this time I put it in. Thanks! Staci, the 2 tbsp of butter goes into the biscuits. You can put extra butter on top after you remove biscuits from oven. Hope this helps. Please forgive me if this questions has been asked before. So you add the 2 TBS softened butter with the wet ingredients into the batter, then use additional butter for the tops? Or is the TBS butter for the tops only?? Thanks! Making these for dinner right now! Janette, the butter is added to the batter. You can place extra butter on biscuits after they come out of the oven. Enjoy! Haha! Nevermind, I see the answer to my question directly above my post. 🙂 That will teach me to check the other posts first. Sorry! Hi! These sound fabulous. My problem is I have two boys who are allergic to nuts. Nuts were my favorite snacks EVER but to make family meals I have to be so careful. What else would be usable? I’ve been thinking maybe a sunflower flour? or maybe a white bean flour…. any ideas? Thanks so much. Ros, try sunflower flour. I haven’t tried it for this specific recipe but I have for others. Please let me know how they turn out! Doubled the recipe from the start! Half gone already. Only the ones in the freezer are left. I’ll cut back on salt next time. I did not have fresh Parmesan, Is the Kraft Parmesan (off-the shelf) saltier than fresh? OMG!! These are AMAZING! I served them as a side with dinner tonight and my grain eating inlaws raved about them! I have been asked to bring them to every family gathering from now on!! LOVE THIS BLOG!! Thank you for making such yummy goodness! They look more like cookies than biscuits. Who cares though if they taste good? I’m so going to be making these for my family. My little girl can’t have these biscuits at Red Lobster and I feel bad for her missing out on something so yummy. I am glad you have enjoyed the biscuits Julie… these are everyone’s favorites! I tried these and they were really good but for me they were a little too salty so Im going to omit the salt and some of the cheddar cheese. I made a double batch and didn’t bake all of it at once so when I baked the second batch about an hour later I put them in convention oven setting and scooped them a little smaller and they didn’t get flat at all and they looked like the ones from Red lobster. I’m going to try this again and see if they bake the same because I liked how the second batch came out. These were a huge hit with my family at dinner tonight. Thanks for such a great recipe! Glad everyone enjoyed them Katie! The first time I made these I didn’t have any parm, and used my own “homemade” coconut flour (which is grittier and doesn’t absorb liquids as well), PLUS I completely forgot about even considering if I needed to make any high altitude adjustments! lol They predictably turned out well . . . flatter than the ones in your picture. 🙂 Tho’ still tasted good. Tonight, I finally had the right almond flour, the right coconut flour, fresh shredded Parm, plus all the other ingredients ready to go. And I remembered to make altitude adjustments! I think these turned out just about perfect, making 10 1/2 small (1 Tbsp) biscuits. I thought I’d share my tweaks, in case it would be helpful for others high altituders. My altitude: just over 6,000 ft. What I did: reduced butter to 1 1/2 Tbsp., added 1 packed tsp of powdered natural protein whey concentrate, and 1 tsp arrowroot powder. Increased oven temp to 375F, baked for 13 min (small biscuits) on parchment paper, in a jelly roll pan. This makes great pizza crust! I made the batter according to the directions, then patted it out onto a 12 inch pizza pan. I baked it, then topped it and baked it again. Delicious! Thank you for the recipe. Sound great Kathy, thanks for sharing! How long did you bake it for both times? Any ideas on how to make a “less flavorful” biscuit for kiddos?? Mine are looking for the old, familiar “baking powder” ones and were too picky for the parmesan and garlic flavor. I know the garlic is easy to take out, but the parmesan seems more important. Any links or ideas would be great! Thanks! Jenni, I have a Drop Biscuit recipe in my first Cookbook, Satisfying Eats, and a Southern Biscuit recipe in Comforting Eats. Both are neutral tasting and Delicious! I’m glad you enjoyed the recipe! I am so excited to try this recipe! My 3 year old daughter has a rare genetic condition called CSID, which basically means she lacks the enzymes to process starch and sucrose. We decided as a family to go starch/ sugar free together, ( with some wiggle room on sucrose using a medication called Sucraid), so being a parent and trying to find kid friendly foods that they will actually eat has been quite a challenge. Our daughter of course loves the foods she can not eat, while our six year old son is your typical picky, I only want to eat mac and cheese and cheese crisps type of kid. This condition has probably been the hardest on our son, and I must admit there has been a few sneak and eats taken place in his room, so he can still enjoy his favorites. Finding recipes like this one is a blessing- it’s all about making things that look and taste like the traditional version, but within the confines of our new diet. Thank you from the bottom of a frustrated and often defeated Mommy’s heart, lol! Wow, just made this recipe for my carb loving kids who are trying to eat lchf. Even the picky 14 year old loved them. Thank you from the bottom of my heart. They are so good. I love your blog! What can I use as an egg replacement for these biscuits ? If you have any idea what would work let me know-thanks! Jen, I have never used an egg replacer with this recipe. If you do, please let me know how it turns out! These are FABULOUS! I had tried a blog recipe for biscuits that used only almond flour, and while they too were good, these are so much better! I can barely taste the coconut flour; I think that most people wouldn’t know it was there if you didn’t tell them. I immediately ate two of them stuffed with turkey and cheese, and I think they will make wonderful breakfast sandwiches. Amazingly tasty for a healthy bread product! I wonder if you could turn one of these into a mini pizza. Any suggestions? I’m wondering if you could bake a few minutes, add some toppings, then bake the rest? For the biscuits, do you think using canned coconut milk in place of heavy cream would work? I have some that I want to use up, and I never have heavy cream on hand (it seems to be impossible to find it without carrageenan, even the organic brands at my supermarket). So good! Husband had no idea they were “grain free”. Delicious! Thank you. These are fantastic! I doubled the recipe and glad I did. I used coconut cream in place of heavy cream and ghee instead of butter. I don’t think the coconut cream left much of a coconut flavor for those of you who don’t like it, I just mainly taste buttery goodness 🙂 Thanks for the great recipe Melissa! Amazing! Big thumbs up from my 6 year old too! Just came across this recipe and I’d love to try it. Has anyone experimented using greek yogurt instead of cream or sour cream? These were TREMENDOUS! Thank you so much! What if all I have on hand is Greek yogurt? I never buy sour cream anymore. That will work. It should not change the flavor. I am OBSESSED with these. They make great biscuits to use with low carb sausage gravy, soooo yummy. We also eat them as a side with other meals. Thanks for the great recipe! THESE WERE AMAZING!! You have just opened up doors for me with this recipe. I’ve missed Red Lobster biscuits so much and this recipe is so close, if not better!!! Thank you thank you and thank you!!! Hands down the best Low Carb/Keto biscuit recipe out there. Every other recipe calls for at least 3 eggs leaving the final product with a distinct egg taste. Not the case here. These biscuits also remain fluffier with a bit more body to them. I make a big batch every weekend and freeze some for use during the week. They make excellent buns for hamburgers or just plain with gravy as an entree. Really a godsend recipe for those craving baked goods on a LC diet. John, I am so glad you enjoyed them! I make these all the time. They are the best! I didn’t have any fresh grated Parm, so I used grated Cotija cheese. I also add dried parsley to the mix and to the melted butter that is brushed over them. They are fabulous!! When I take them to potlucks, I never have any left over to take home. I double the recipe and use a 2 Tablespoon scoop and get about 24 biscuits. Thank you so much for this recipe. Donna, I am so glad you enjoy these biscuits! I love the addition of the Cotija cheese… yum! Absolutely delicious. I have not found a grain free biscuit I really like until today. Thank you for these. Rachel, so glad you have enjoyed them!